Plate 14 from the fourth set of Thomas and William Daniell's 'Oriental Scenery,' which they called 'Twenty-four Landscapes.' The views progress northwards from the far south at Cape Comorin to Srinagar in Garhwal in the Himalaya mountains. 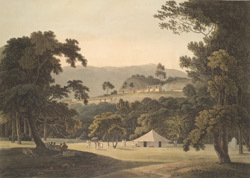 Thomas and William Daniell camped at Kotdwara at the foot of the pass leading into the mountains of Srinagar. They were the first Europeans to follow that route and were carried by porters in palanquins, called jampans, like the ones that can be seen under the tree, on the left in the aquatint.